Ready to pull the hybrid trigger? The sounds, functionality and flexibility on offer will arguably see many current SPD-SX users switching in favour of a separate module-and-trigger setup. When it comes to going hybrid, Roland has carved the path. In recent years, we’ve seen the SPD-SX, TM-2 and SDP-One pads all offer solutions to gigging drummers wanting to incorporate electronics into an acoustic setup. At the heart of this solution remains the same requirements: supplementary sounds to augment a standard kit, playback of backing tracks and tempo-sensitive phrases, custom sounds and convenient playing surfaces. So, with an already extensive list of products filling its catalogue, Roland has that sorted then, yes? 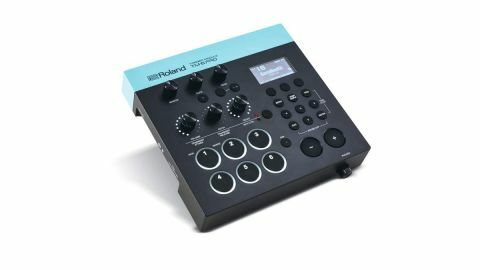 Well, apparently not, as the TM-6 Pro was announced earlier this year alongside the RT-MicS to add even more lines to Roland’s ever-expanding line of hybrid gear. First off, let’s consider where the TM-6 fits. The SDP-SX - Roland’s flagship pad and instantly-recognisable industry standard - offers all of the requirements mentioned above, but it uses fixed playing surfaces, doesn’t offer hi-hat pedal control, has internal memory and a limited number of inputs for additional triggers to place around your kit. The TM-2 is like a Swiss Army Knife of simple hybrid capability, complete with SD card slot. But again, it offers limited trigger input for bigger kits, and integrating backing tracks for live use is a fiddly work due to the lack of output busses. The recently-launched SPD::One pads are each brilliant at their intended purpose, however, they aren’t really a full-stocked solution. All of these products have their place, depending on your requirements and how far down the hybrid rabbit hole you’re intending to delve. As you can tell, the TM-6 Pro is extremely well-stocked, and the obvious comparison (thanks to the name) is to think of it as a big-boy version of the TM-2. It basically offers the same level of sound sources as an electronic kit’s module, including 500 brand new sounds created by the likes of Michael Shack, Kaz Rodriguez and Chris Whitten, but with the integration of features that will be invaluable when playing live. And it’s obvious Roland has listened and thought about exactly what those needs are. Upon taking the module out of the box, you’re met by its simple and stylish layout. There are six bold softswitches, three rotary controls for editing your sounds, plus a slick-looking LED screen and smaller buttons for navigating through the module. The three pots at the top edge of the module give you control over the master output and click/song volume (more about that later). It’s all very intuitive. There’s a lot going on inside, so unlike the TM-2, the TM-6 is powered by mains only, and our first (and admittedly only) complaint comes before we switch on: how do we mount it? The answer, frustratingly, is that in order to mount the TM-6 within your kit, you’ll need to purchase one of Roland’s solutions: the APC-33 or PDS-10 stand. These are heavy-duty solutions, and it’s a shame that there is no ‘basic’ mounting option included in the box as with the TM-2. If you’re feeling miserly, you could repurpose a spare snare stand, however, we mounted the TM-6 to our PDS-10 with minimal fuss. Once we got going, the TM-6 was everything we’d hoped. It’s easy to use: either striking a connected trigger, or tapping those soft switches selects the voice you wish to control and thanks to the simple layout and labelling, you won’t need to consult the manual in order to start with the sounds. Each trigger input is actually a dual socket, so you can connect a stereo (rim and head) trigger, or two mono triggers by splitting the input with a Y-cable. The sounds are easily assigned as A or B for each input, and the screen makes it very clear as to which side of the input you’re currently editing. One of the biggest criticisms of Roland’s previous hybrid products has been the lack of hi-hat pedal control, so it’s great to see it included here. We connected our CY-5 pad and FD-8 controller, and had it configured in seconds, finally opening up the possibility of using authentic electronic hat sounds in a controllable way. Another big feature of the TM-6 is the click track management. We first saw Roland’s concept last year on the SPD::One Wav pad, and it certainly offers an easy solution to the problem of playing to a click live without the audience hearing your metronome. It works like this: two almost identical files are exported (by you) onto an SD card. One is your backing track that the audience will hear and is sent to the main outputs. The other shares the same filename with ‘_click’ and contains the click sound. This goes to your in-ears. When the song is started, both files are played back simultaneously and you get the click while everyone else gets a perfect backing track. Simple! The only extra functionality we’d like is the inclusion of an audio input, allowing the TM-6 to be a complete hub for our monitor mix alongside our backing tracks. Greedy? Yes we are.